From Spanish-born filmmaker J.A. 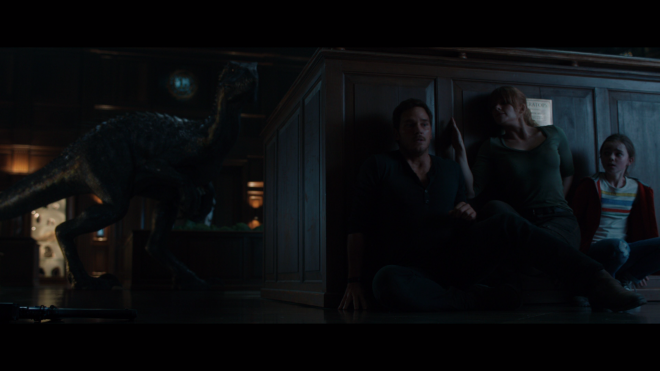 Bayona, Jurassic World: Fallen Kingdom is a serviceable and amusing-enough sequel, delivering an unexpectedly bland story that's tolerably fun. Chris Pratt and Bryce Dallas Howard return for another disastrous adventure through science run amok, littered with lovely screensaver images that ultimately fall flat. The dinos wreak havoc on 4K Ultra HD Blu-ray with an outstanding Dolby Vision presentation and a sensational, reference-quality DTS:X soundtrack. With a small but decently informative assortment of supplements, the overall package is Recommended for fans of the franchise and those hungry for more Dolby Vision or DTS:X goodness. Early into Jurassic World: Fallen Kingdom, the direct follow-up to Colin Trevorrow's 2015 box-office juggernaut, Jeff Goldblum makes an appearance reprising his role as chaos theorist Dr. Ian Malcolm from Steven Spielberg's original and now-classic Jurassic Park. Testifying before a Senate hearing on whether the dinosaurs from the previous movie should be saved from an impending volcanic eruption, the mathematician suggests allowing the cloned animals to once again go extinct. He reasons humanity has done enough damage to the natural order of things and rescuing the animals will only lead to more harm. Of course, this being a franchise specifically about engineered dinosaurs and human interference, someone is bound not to heed the doctor's logical warning. And in a cinematic universe where characters are fully aware of the devastation and fatalities caused in the previous films, it's admittedly interesting, if also somewhat entertaining, to watch those characters ignore history and think they can avoid repeating the same mistakes. The man leading the rescue mission from the bed-ridden comfort of his massively luxuriant estate is Sir Benjamin Lockwood (an underused James Cromwell), John Hammond's former business partner. 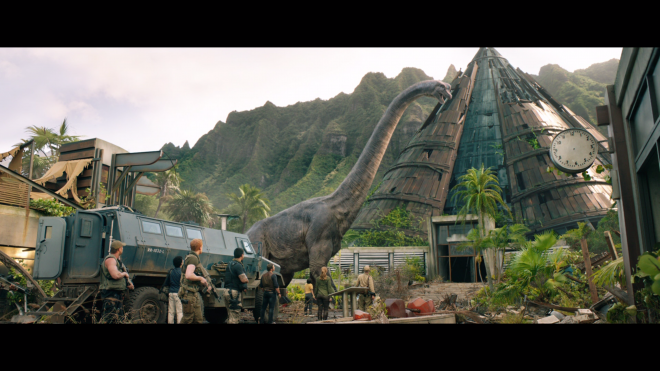 Naturally, he hires Claire (Bryce Dallas Howard) and Owen (Chris Pratt) to return to the island they narrowly escaped a few years earlier because they possess a particular set of skills necessary for this ambitious operation — along with also thwarting the obvious evil plans introduced in the second act. 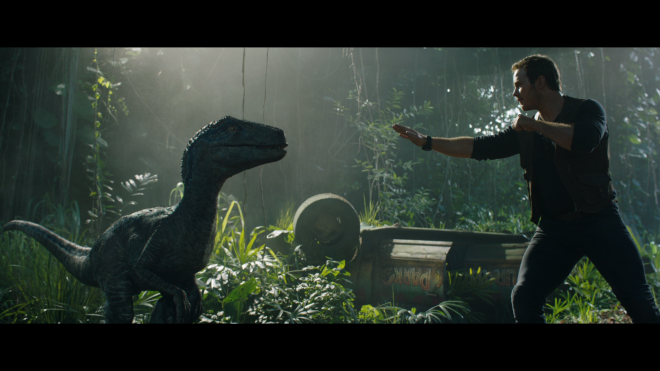 Derek Connolly and Trevorrow's script reunites the two stars for this sequel in the most contrived manner that feels largely like a repeat of their first meeting. Claire is tasked by a superior to essentially fetch Owen, who is now building a cabin instead of working on his motorcycle. (You know, typical manly stuff.) Part of the fun in the first movie was the chemistry-driven banter of Howard and Pratt, which still continues here for the most part, but it's not quite as amusing or comedic. As romantic leads, their charm feels shallow and their predictable reunion is out of convenience. Perhaps, it has something to do with both characters being preoccupied with more pressing issues, such as the seasoned, trophy-collecting mercenary Ken Wheatley (Ted Levine) gathering the animals for more nefarious reasons. Or in the case of Owen, Pratt is distracted with practicing his manly glare, staring at others fixedly as though looking off into the distance. 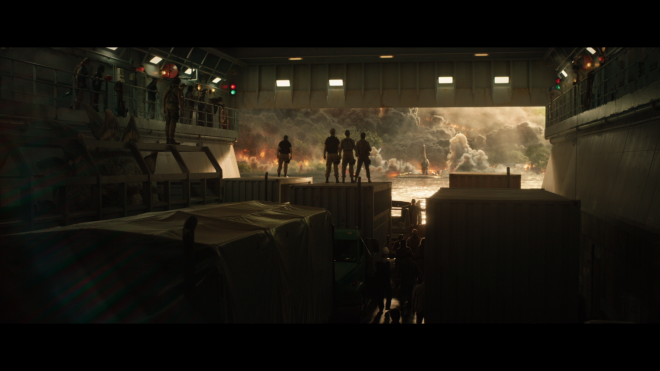 Whatever the case may be, the plot tries to ratchet the suspense and urgency as though the race against a massive volcano eruption were not enough. Now, our would-be heroes have to combat corporate greed, turning this production into a blend of The Lost World and Jurassic Park III. The protagonists are deceived into returning to the island, and the dinosaurs are again brought to California where they expectedly wreak havoc. Ironically, the merger plays out much better in this movie than in those aforementioned two, but Lockwood's granddaughter Maisie (Isabella Sermon) and Eli Mills (Rafe Spall) have much to do with that, providing some well-earned dramatic tension going into the film's second half. 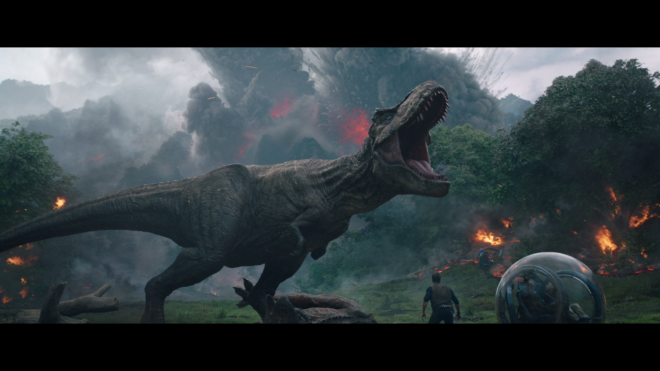 These few positives, however, are not exactly meant to suggest Jurassic World: Fallen Kingdom is a great film, but rather, it's a serviceable follow-up that's on par with its predecessor. Director J.A. Bayona does well behind the camera, balancing the comedy with the action — of which there is plenty of, to be sure — and turning an unexpectedly bland story into tolerably fun, something that's better than the sequels of the original trilogy and a good addition to the overall franchise. Unfortunately, such soft, middling praise comes with some reservations, seeing as how the massive production comes from the same filmmaker as The Orphanage and A Monster Calls. Working with long-time collaborator and cinematographer Óscar Faura, Bayona seems so committed on delivering stunning visuals that he forgot to make a suspenseful movie or do something worthwhile with the overarching theme, littering the screen with lovely screensaver images that ultimately fall flat and supplying stunning, ear-deafening eye-candy that fails to captivate. 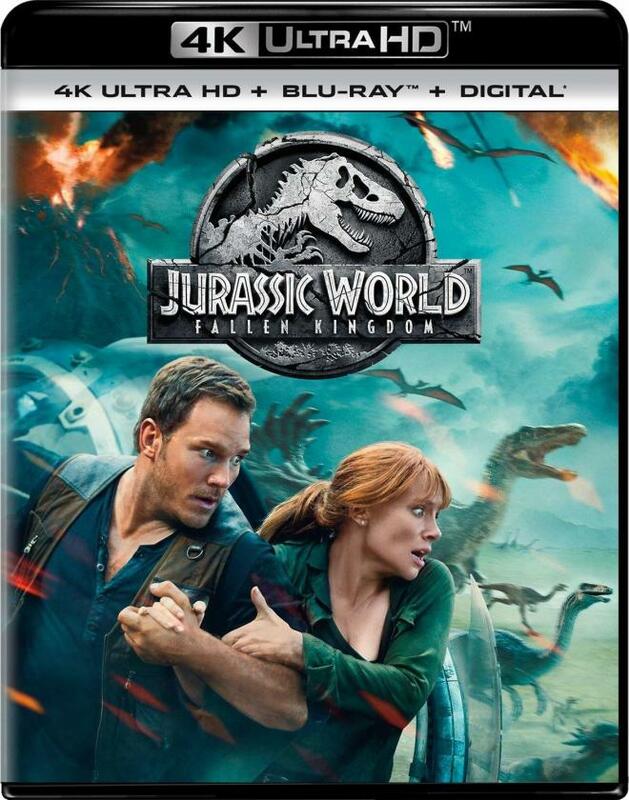 Universal Studios Home Entertainment brings Jurassic Park: Fallen Kingdom to 4K Ultra HD Blu-ray as a two-disc combo pack with a Digital Copy code. When redeeming said code via Universal's website, Movies Anywhere or VUDU, users have access to the 4K Dolby Vision version with Dolby Atmos. The triple-layered UHD100 disc sits comfortably opposite a Region Free, BD50 disc inside a black, eco-elite case with a glossy, lightly-embossed slipcover. At startup, the disc goes straight to a menu screen with the usual options along the left side, full-motion clips, and music playing in the background. All bonus materials can be found on the 4K Ultra HD disc as well as the standard Blu-ray. Monster in a Mansion (2160p, 3 min): Bayona discusses how the original Jurassic Park and Dracula (1979) influenced his approach to a specific scene.